Below you fill find all funeral homes and cemeteries in or near Spokane. Popular neighborhoods in Spokane include: Chinatown. Suburbs of Spokane: Spokane Valley, Spokane Vly, City of Spokane Valley, Cty Spok Val, Liberty Park, Manito, Shadle Garland, Sunset Hill, Avista Corp., Gonzaga Univ, Millwood, Public Safety Bldg, Spokane City Trea, Spokane District Office, Whitworth University. Spokane is also known as: Spokane County / Spokane city. Their current mayor is Mayor David Condon. Zip codes in the city: 3, 99224, 99228, 99251, 99252, 99256, 99258, 99260, 99299. Spokane County funeral flowers can be purchased from one of the local funeral shops we partner with. There are currently 16 funeral options for this city. Spokane has been featured in films like: Mozart and the Whale (2005), The Cutter (2005), End Game (2006), and Benny & Joon (1993). Some of the notable people born here have been: Barbara Moore (actor and model), Joe Danelo (american football player), Jason Hanson (american football player), Steve Emtman (american football player), Steve Gleason (american football player), Jay Pickett (actor), and Chad Little (lawyer and race car driver). Spokane is home to the following sports teams: Gonzaga Bulldogs men's basketball and Spokane Indians. Spokane (pronunciation: /spoʊˈkæn/ spoh-KAN) is a city in the state of Washington, in the northwestern United States. It is the seat of Spokane County. It is located on the Spokane River west of the Rocky Mountain foothills in eastern Washington, 92 miles (148 km) south of the Canadian border, approximately 20 miles (30 km) from the Washington–Idaho border, and 280 miles (450 km) east of Seattle along Interstate 90. The city and wider Inland Northwest region is served by Spokane International Airport, 5 miles (8 km) west of downtown Spokane. According to the 2010 Census, Spokane had a population of 208,916, making it the second largest city in Washington and the 102nd largest city in the United States.The first humans to live in the area, the Spokane people (their name meaning "children of the sun" in Salishan), arrived between 13,000 and 8,000 years ago, living off plentiful game. 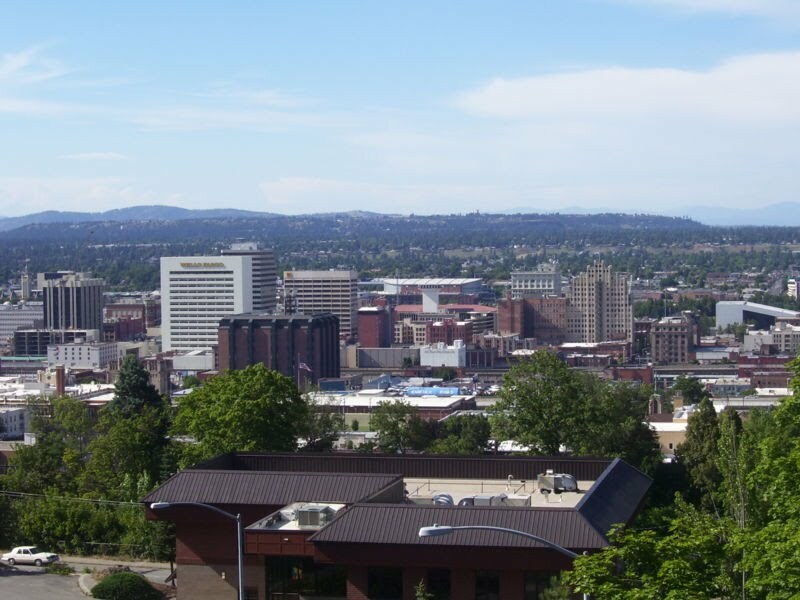 Known as the birthplace of Father's Day, Spokane is officially nicknamed the "Lilac City". David Thompson explored the area with the westward expansion and establishment of the North West Company's Spokane House in 1810. This trading post was the first long-term European settlement in Washington. Completion of the Northern Pacific Railway in 1881 brought settlers to the Spokane area, and that same year it was officially incorporated as a city with the name "Spokane Falls". In the late 19th century, gold and silver were discovered in the Inland Northwest. The local economy depended on mining, timber, and agriculture until the 1980s. Spokane hosted the first environmentally themed World's Fair at Expo '74.Many of the older Romanesque Revival-style buildings in the downtown area were designed by architect Kirtland Kelsey Cutter after the Great Fire of 1889. The city also features Riverfront and Manito parks, the Smithsonian-affiliated Northwest Museum of Arts and Culture, the Davenport Hotel, and the Fox and Bing Crosby theaters. The Cathedral of Our Lady of Lourdes serves as the seat of the Roman Catholic Diocese of Spokane with Thomas Daly as the newly appointed Bishop as of 2015. The city is also the center of the Mormon Spokane Washington Temple District. Gonzaga University was established in 1887 by the Society of Jesus, and the private Presbyterian Whitworth University moved to north Spokane in 1914 from Tacoma, WA. In sports, the Gonzaga Bulldogs collegiate basketball team competes at the Division I level. Professional and semi-professional sports teams include the Spokane Indians in Minor League Baseball, Spokane Shock in arena football, and Spokane Chiefs in junior ice hockey. As of 2010, Spokane's only major daily newspaper, The Spokesman-Review, had a daily circulation of over 75,000. It was revealed on March 31st, 2019 that Andrea Aaron Martin (Halvajian) passed away in Spokane, Washington. Ms. Martin was 34 years old. Send flowers to express your sympathy and honor Andrea Aaron's life. It was written on March 24th, 2019 that Margaret Jewett Greer passed away in Chevy Chase, Maryland. Greer was 89 years old and was born in Spokane, WA. Send flowers to share your condolences and honor Margaret Jewett's life. It was written by Ellensburg Daily Record on March 23rd, 2019 that Andrew "Andy" Jenkins passed on in Spokane, Washington. Jenkins was 61 years old. Send flowers to share your condolences and honor Andrew "Andy"'s life. It was revealed on March 20th, 2019 that Liana Delsie miss "Tiny" Spino passed away in Spokane, Washington. Spino was 37 years old and was born in Madras, OR. Send flowers to express your sympathy and honor Liana Delsie miss "Tiny"'s life. It was reported on March 3rd, 2019 that Muriel Fay Gehrman (Morgan) died in Spokane, Washington. Ms. Gehrman was 81 years old and was born in Honolulu, HI. Send flowers to express your sympathy and honor Muriel Fay's life. It was disclosed by Orange County Register on February 3rd, 2019 that John Day Horrall passed away in Laguna Hills, California. Horrall was 96 years old and was born in Spokane, WA. Send flowers to express your sympathy and honor John Day's life. It was written by The Star on January 30th, 2019 that Charles Patrick Potts passed on in Charlotte, North Carolina. Potts was 54 years old and was born in Spokane, WA. Send flowers to express your sorrow and honor Charles Patrick's life. It was noted by Register Guard on January 16th, 2019 that Emily Christine miss Iverson perished in Lane Co, Oregon. Iverson was 35 years old and was born in Spokane, WA. Send flowers to share your condolences and honor Emily Christine miss's life. It was noted by Register Guard on January 13th, 2019 that Carole Rice (Wright) died in Eugene, Oregon. Ms. Rice was 83 years old and was born in Spokane, WA. Send flowers to express your sorrow and honor Carole's life. It was reported by The Mail Tribune on January 13th, 2019 that Kathleen Opitsah Timmerman (McShane) died in Grants Pass, Oregon. Ms. Timmerman was 92 years old and was born in Spokane, WA. Send flowers to express your sympathy and honor Kathleen Opitsah's life. Planning a funeral can be overwhelming. iMortuary strives to make this process less stressful. Browse iMortuary to find comprehensive listings of funeral services such as: funeral homes, cremation providers, funeral flowers, and Spokane area cemeteries. Spokane has a rich history. Humans began to live in Spokane between 8-12 thousand years ago. The Spokane tribe are thought to be related to the original people who inhabited the area. When early white explorers found the area they created a trading post for fur traders. Spokane later became one of the nation's most productive mining areas. The official website for the city of Spokane is https://my.spokanecity.org/. After living in Omak for seven years, they moved to Spokane and lived there for ... 00 p.m. at the Elks Lodge #1742 in Omak, WA. All family and friends are invited. Arrangements by Welch-Ryce-Haider Funeral Chapels. Memorials in her memory may be made to Meals on Wheels, 1222 W. Second Ave., Spokane, WA 99201. Heritage Funeral Home, N. 508 Government Way, Spokane, WA 99224 is in charge of arrangements. A reception will immediately follow the funeral service. Burial will be at Sunset Memorial Gardens in Richland. In lieu of flowers, donations can be made to Shriners Hospital for Children, 911 W. 5th Ave. Spokane, WA 99204, or to a charity of your choice. Funeral services will be conducted at noon Saturday ... At the time of his retirement he was a member of the Spokane Teamsters Local 690. He was married to Pamela VanDerhoff on Dec. 23, 1981. They moved to Clark Fork in 1992, where he has since resided. Funerals in Spokane, WA on Yahoo! Local Get Ratings & Reviews on Funerals with Photos, Maps, Driving Directions and more. Listing all funeral homes in Spokane, Washington so you can easily send flowers to any location (same day delivery) or find any funeral service. We work with local florists and flower shops to offer same day delivery. You will find budget sympathy flowers in Spokane here. Our funeral flowers are cheap in price but not in value.